On November 3, 1890 the couple completed their Application for Marriage License at the Clarion County Courthouse. The left hand page of the application records their names, ages, place of birth, parent's names and occupation. The couple's signatures are shown in the lower section. The license indicates Joseph W. Selker, age 25, was born in Germany the son of George & Katherine Elizabeth Selker. Frances Philomena Selker, age 27, was born in Clarion, Pennsylvania the daughter of Leopold & Theresa Guth. Joseph's occupation is recorded as cigar manufacturer. The right hand page includes the marriage license and details of the the marriage location. The marriage license was issued on November 3, 1890. The couple was married November 4, 1890 at the Immaculate Conception Church in Clarion, Pennsylvania. The duplicate certificate was filed January 17, 1891 and was recorded as no. 766. Joseph William Selker and Frances Philomena Guth are my 2nd great-grandparents. Their line extends through their daughter Frances Philomena Selker to my paternal grandmother Mary Eugenia McDonald. "This collection includes civil marriage records created in Pennsylvania counties. The records include registers, affidavits and marriage licenses. In some instances, divorce records are recorded with marriages." 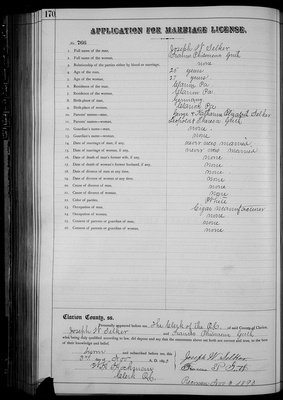 "Pennsylvania, County Marriages, 1885-1950," index and images FamilySearch (https://familysearch.org/pal:/MM9.3.1/TH-1951-20637-16835-61?cc=1589502 : accessed 28 March 2015), 004811664 > image 532 of 666; county courthouses, Pennsylvania.